Learn More about Hardee's® Franchising Below! Michigan we've set our sites on you! We are seeking highly qualified and experienced candidates to franchise with us. 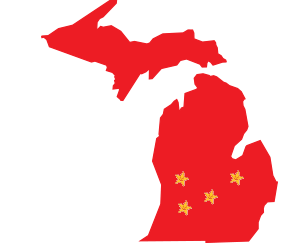 421,500 restaurant and foodservice jobs in Michigan in 2016, which equals 11% of employment in the state. And by 2026, that number is projected to grow by 10.3% or 43,600 additional jobs, for a total of 465,100. With over 3,600 total CKE franchised and company owned restaurants, and more than 2,100 Hardee's® specific, we are dedicated to helping franchisees build growing restaurant operations that are sustainable for the long term. To this end, the strategy and core positioning of the Hardee's® banner is oriented to building top-line sales that support franchise profitability via premium product strategy, strong restaurant fundamentals, and cutting-edge advertising. With best-in-class menus, innovative systems, and outstanding brand recognition, we are poised for sustained growth around the world.